The purpose of the project “Database of 1500 women experts in Serbia” is to present an impressive database of educated and experienced women professionals. 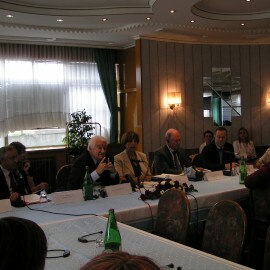 Project is implemented by organizations “Women’s Government” and “Equal Opportunities”, and supported by National Investment Plan (NIP) in 2008. The first and only gender equality online course in Serbian / Croatian / Bosnian language. Project supported by Canadian International Development Agency (CIDA). EC Project “The return of women to the labour market – training program for unemployed women” was intended for unemployed women between 35 to 55 years of age from Belgrade, who wanted to return to the labour market, improve their work quality and their professions. Project completed 2006-2007 in cooperation with CSO Center for Democracy Foundation. Project supported by ICT private sector in 2006. Computer training for 13 unemployed women, project supported by Novi Beograd Community in 2006. Fund for an Open Society and NGO “Equal Opportunities” signed a project financial support contract: Gender Equality In Building Up Information Society. Project was implemented from 1st December 2005 to 30th April 2006. Panel discussion “Gender Equality In Building Up Information Society – Guidelines, checklists and proposals for initiating of projects in the implementation process of NSIS in Serbia” was held on April 6, 2006 at the Faculty of Traffic and Transport Engineering in Belgrade. ICT training for 30 children and five teachers, project supported by ICT private sector in 2005. Within the scope of its activities “Gender Equality in the Development of the Information Society”, association “Equal Opportunities” has organized the 3rd Round table “The World Summit on the Information Society and gender equality”, with full support of Gender Caucus of the World Summit as well as the support of companies: Telekom Srbija, JP PTT Srbija, ZJPTT, Ericsson, Telegroup, Intracom, Veratnet i Eunet. Computer training for 190 teachers from rural areas, project supported by Ministry of Education in 2004. As a part of “Training of ICT Trainers” project, “Equal Opportunities” is organizing module “PC Introduction” with the goal to increase the IT literacy of various target groups. This project was selected as one of the 6 finalists for the Gender and ICT Awards 2003. It is supported by ICT private sector (ICT vendors, operators, Internet service providers).